Two firefighters died Sunday afternoon as a fast-spreading wildfire in Los Angeles County grew to more than 42,000 acres, a fire official said. “I have some sad news to report,” Deputy Fire Chief Michael Bryant told reporters. “Two of our firefighters were in a vehicle and went over the side and both of them suffered … life-ending injuries.” The accident happened near Acton, about 25 miles north of central Los Angeles during “intense fire activity that was occurring near Mount Gleason,” Bryant said. The incident was being investigated. The blaze, know as the Station fire, started on Wednesday in the Angeles National Forest and La Canada Flintridge area. The blaze had burned 42,500 acres by Sunday, according to U.S. Forest Service Incident Chief Mike Dietrich, who said at least 18 structures had been destroyed. More than 2,800 firefighters battling the Station fire had contained only about 5 percent of the blaze, Dietrich said. The wildfire was threatening about 10,000 homes, 500 businesses and 2,000 other structures, the Forest Service said. “This is still a very serious situation,” Dietrich said, noting that he expected dangerous “red flag” conditions to last until at least Monday evening. Watch the flames consume acres of land » On Friday, California Gov. 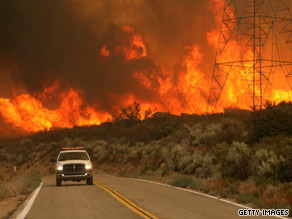 Arnold Schwarzenegger declared a state of emergency as a result of the fire. Fierce flames were putting people and homes at risk as the strongest part of the fire moved northwest toward Acton, Jennifer Sanchez of the Forest Service told CNN on Sunday. Evacuations were ordered for an unspecified residents and some off-ramps on the Antelope Valley Freeway, also known as the 14 Freeway, were closed. Watch iReporters’ footage of the wildfire » Three people suffered burns while in the Big Tujunga Canyon recreational area, where three homes were destroyed by the fire, said Bruce Quintelier, fire information officer for the Forest Service. In addition, two to three dozen recreational cabins were destroyed, said Randi Jorgensen, another U.S. Forest Service information officer. Flames also threatened communication towers on Mount Disappointment and Mount Wilson, used for civil communication and local television and radio signals, Quintelier told CNN. The governor also declared a state of emergency in Monterey County, where one blaze, called the Gloria fire, has burned about 6,500 acres, and another, called the Bryson fire, has charred more than 3,000 acres, according to the Forest Service. Watch CNN’s Reynolds Wolf explain why the fire is spreading » Three people hurt in the growing wildfire were burned because they “did not listen” to orders to evacuate, Schwarzenegger said Sunday. “I want to urge everyone living near any of the fires, please, listen and follow evacuation orders from local officials. They will not tell you to evacuate if it’s not necessary,” he said. “Listen carefully — there were again people that did not listen and people that got burned and really badly injured because they did not listen.” Forecasters say the Mediterranean-style climate of the central and southern region of the state help fuel the wildfires, along with triple-digit temperatures, dry foliage and low humidity.